We are pleased to announce the newest addition to The Chicago Project, Regina Mamou. Regina (b. 1983, Southfield, Michigan) was born to an Iraqi father and American mother in the Detroit metropolitan area. She is a visual artist working in photography and video who is currently based in Chicago. Her work is often tied to a particular location and time period, and examines the memory of place from personal and historical perspectives. Regina engages in a researcher’s process of exploring historical events while utilizing key tropes of landscape photography. In 2009, she received a 15-month Fulbright Fellowship to Jordan to explore navigational methods and memory in Amman. She holds an MFA from the School of the Art Institute of Chicago and BFA from the Rhode Island School of Design. Regina has exhibited her work nationally and internationally, selected exhibitions include Makan Art Space in Amman, Jordan (2010) and Action Field Kodra’s 11th Exhibition of Contemporary Art in Thessaloniki, Greece (2011). Below are a few of Regina’s pieces along with her artist statement. Be sure to visit Regina’s Chicago Project page to see more of her work. My interest in New Harmony was solidified after I visited the town for an exhibition in 2011. As I researched its history, I became drawn to the way ideological and religious beliefs shaped the architecture, geography, and landscape. These views are literally etched into the natural and artificial elements of the community. As an artist working in photography, I documented these markers of the town with a large format camera, creating imagery that utilizes key tropes of landscape photography, such as seductive lighting, a sense of tranquility, and a pristine natural environment. 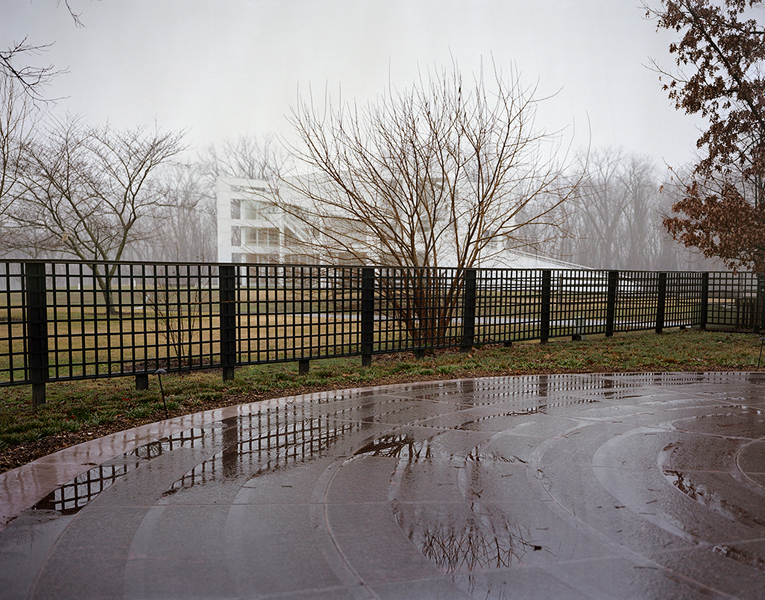 The images from the first part of Pictures for Conceptual Living speak to this Utopian community”s history, one that incorporates the duality of idealism and incompletion. (2) The title of the series serves almost as an instruction manual, a model of didacticism for a lifestyle conceived as a metaphysical interpretation of life, acted out in reality. Moreover, on observing New Harmony, there are few elements of the town that have not been crafted and honed for the sake of a Utopian vision. 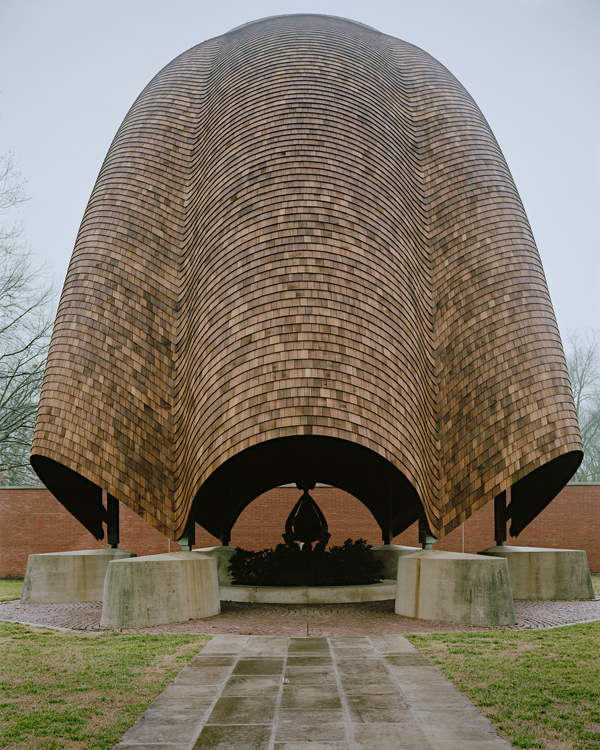 The roofless church, walking labyrinths, nature trails, and St. Francis’s Chapel and nearby lake, are part of the vision of the Harmonists, either directly or through attribution and homage to their legacy. My aim was to capture this conundrum of spirituality, one that is embedded in a particular space naturally, as well as superimposed on it by the sheer force of defining a specific vision of godliness. (1) “The Harmonie Society” (last accessed on 12 May 2012). 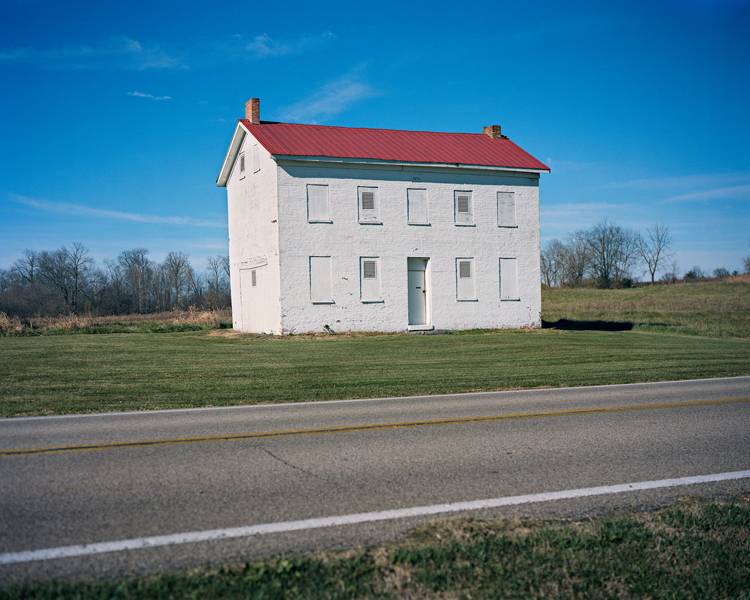 (2) The second part of this project is a continuation of the series with an examination of historical, Utopian communities established before the fin de siècle in the United States, these utopias include: The Inspirationists (Amana, Iowa); the Icarians (Nauvoo, Illinois); the German Colonists (Bethel, Missouri); the Shakers (Harrison, Ohio); the Zoarites (Zoar, Ohio); and the Harmonists’ first and last communities in Harmony and Economy, Pennsylvania.